Ta-da! Get ready for MORE!jones with Juanita MORE! and her trusty team, chef Cory Armenta and Cole Church. Photo: Molly DeCoudreaux. Sundays are all about Juanita’s open-faced chilaquiles sandwich at her drag brunch. Photo: Molly DeCoudreaux. Juanita at home with her famed fried chicken and biscuits. Photo: Mr. Joe Montana. Some updates for you around town, starting with the news that over at ~JONES~, there’s someone in the kitchen and she’s gonna need a big hairnet! Local treasure and drag KWEEN Juanita MORE! 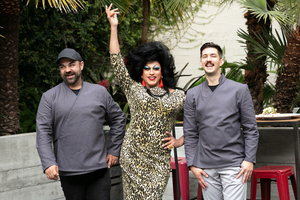 is known for hosting her annual Sunday Pride Party there, but has now taken over the restaurant and banquet services, along with chef Cory Armenta (Fork & Spoon Productions, Hecho, Hi Tops) and food stylist Cole Church (who has cooked with Juanita for more than 10 years). Starting today (Tuesday September 4th), it’s now called ~MORE!JONES~. Look for some more Latin-Mediterranean flavors on the menu, including her French-style carnitas, pizzas (there’s a meatball pizza, oh yeah), and her famous chicken livers. Of course, she snuck a poblano chile relleno and jalapeños en escabeche on her half-pound burger. You’ll see farm-fresh and peak-season ingredients from Feral Heart Farm on the menu as well, and there will also be a cocktail pairing menu. And tres leches cake for dessert! 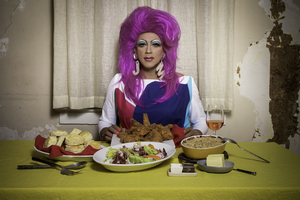 Miss More has hosted numerous pop-ups over the past 15 years, serving her famed tamales and fried chicken at various venues. She previously had her own catering company, in addition to working the line in both New York and SF restaurants, as well as working for Dean & DeLuca and Williams-Sonoma. Look for some fun nights during the week, including an affordable three-course, family-style dinner on Wednesday evenings for $35 (Sept. 12 is fried chicken with honey goo, Sept. 19 is pozole rojo, and Sept. 26th is beef and pork meatballs). 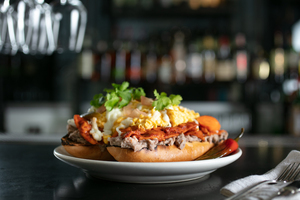 And of course there will be an over-the-top drag brunch on Sundays with her open-faced chilaquiles sandwich and her hangovah pizza (with pork sausage, mushrooms, spinach, cheese, and eggs). And Biscuit Island. (Can I get a cabana there?) There’s that lovely patio and three bars, so this brunch is going to be a hit. No wig snatching! Dinner is Tue-Sat 5pm-9pm and brunch is Sun 11am-3pm. 620 Jones St. at Geary. The newly open ~THEORITA~ from the Che Fico team (pastry chef Angela Pinkerton and chef David Nayfeld) is now serving dinner. You can take a look at the menu, which includes a few salads (like Asian chicken and a Cobb), a burger (of course), a fried chicken sandwich, vegetarian chili, and of course save room for dessert. The diner-inspired menu will ramp up in time. Dinner 5pm-11pm. 838 Divisadero St. at McAllister. Another spot you can grab dinner is at Adam Mesnick’s ~THE BOARD~ in SoMa. Just look at his Insta and you’ll see the evil double cheeseburgers he’s grilling up, along with buffalo wings and other things that are oh so good, oh so bad. Wed-Fri 6pm-9pm.